Team Tuktanic (aka Laura & Cathy) are off on a madcap race which entails us driving 3,500km across India in the name of charity. We will spluttering along a route as yet unknown (navigation and direction will be a daily calculation, finger to the wind) in the ultimate long distance vehicle… a tuk tuk. Unlike other charity events, this one will be entirely unsupported. No backup teams, we will be entirely on our own resources. We will be taught how to drive and repair our tuk tuk (a necessary daily chore). We get a start and end point; the route is of our own choosing. The map here is a vague construction of what our route might be. Why are we doing this? Well apart from a desire submit our bodies to extreme feats of endurance, there are three very worthwhile charities who could do with your support. The first is FRANKWATER a charity working locally in India to set-up sustainable community-owned water projects in some of the poorest regions and villages. FRANKWATER is the main charity supported by all teams taking part. The following two charities are the choice of myself and Laura. The second is CANCER RESEARCH UK as we both have been affected by family members dealing with cancer. 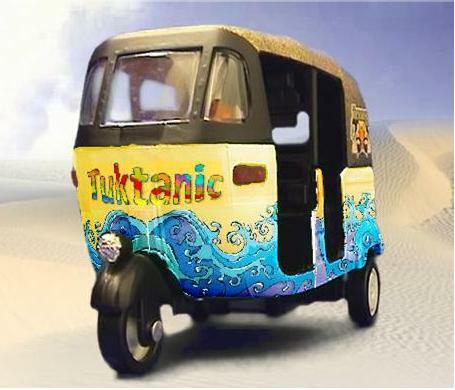 ps if you are a company and would like to be one of our official sponsors us … £500 buys your company logo space on our tuk tuk! Our fabulously designed little rainbow sea and sunshine decorated Tuk!